I mean, seriously, how cool is that? 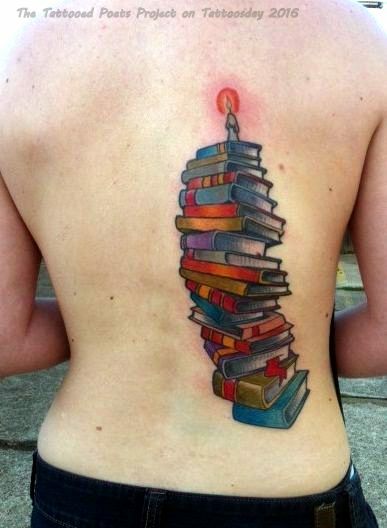 "As a writer, when I thought of getting tattoos, I always thought I'd get a particular passage or an image from one book or another. But the more I thought about it, the more I realized that there were too many. Being a reader and a writer make me part of a tradition so big and so old that I'll never even read a tenth of a percent of what's already in the world. So I decided to get the biggest stack of books that would fit on my torso. But not a tidy stack. I wanted a stack that was toppling, like it was always about to tip over with its own weight. No titles. Just a stack of books always waiting to be opened." to make examples in large letters. and improvable to each other. with any part of my own body. Katie Bickham's first book of poetry, The Belle Mar, was selected by Alicia Ostriker as the winner of the Lena-Miles Wever Todd Prize, and was published in 2015 by Pleiades and LSU Presses. Her work has also won the Editor's Prize from The Missouri Review, and has been published or is forthcoming in The Southern Quarterly, Prairie Schooner, Pleiades, The Missouri Review, Deep South Magazine, and elsewhere. She earned her MFA from Stonecoast at the University of Southern Maine. Katie teaches creative writing at Bossier Parish Community College in Louisiana. Visit her at www.katiebickham.com. Thanks to Katie Bickham for sharing her amazing tattoo and poem with us here on Tattoosday's Tattooed Poets Project! It's not my favourite, but you have to like that tattoo.